1. Please read the instructions, procedure and Information Bulletin carefully before you start filling the Application Form. 4. Please ensure your eligibility as per the criteria laid down for JEE (Main), JEE (Advanced) and participating State Institutions (as applicable). (I) All the Indian citizen candidates should possess AADHAAR card issued by UIDAI. 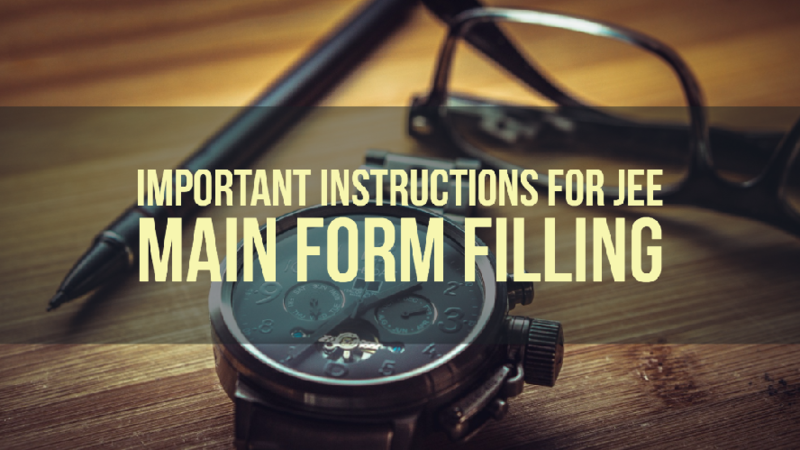 At the time of filling application form of JEE (Main)–2017, the candidates will have to enter their AADHAAR number, name, date of birth & gender which will be validated with the UIDAI’s data. In case, these particulars do not match, the candidates will not be able to fill the application form for JEE (Main)–2017. Therefore, the candidates are advised to ensure that their AADHAAR card has correct details of their name, date of birth & gender as per school records. If there is some mismatch in these details, the candidates should immediately get it corrected in AADHAAR data or school records, as the case may be. (III) In order to facilitiate such applicants who are not having Aadhaar, the CBSE has specially set up facilitation centres in each city of examination for the purpose of Aadhaar enrolment. The applicants can approach such facilitation centres who will not charge any amount from any applicant for Aadhaar enrolment. The list of the facilitation centre is available on www.jeemain.nic.in. These applicants who have enrolled for Aadhaar and have not received Aadhaar should enter 28 digit Aadhaar Enrolment ID printed on the Aadhaar enrolment slip at the time of filling online application form for JEE(Main) 2017. (IV) In case Aadhaar enrolment facility is not available at the facilitation centres, the applicants should submit a request for Aadhaar enrolment. The facilitation centre will issue a registration number to such applicants. This registration number should be entered by the applicants at the time of filling online application form for JEE(Main) 2017. (V) The above provisions shall be applicable in all states except J&K, Assam & Meghalaya. (VI) The applicants who have passed or appearing in Class XII examination from the states of J&K, Assam & Meghalaya need to enter the passport number, ration card number, bank account number or any other valid Govt. identity number provided they should select the city of examination in these states only.The online application process will start from 01st December, 2016 onwards. The last date for application is 02nd January, 2017 and fee can be paid upto 03rd January 2017. 7. The fee may be submitted either by any credit/debit card or through e-Challan of Syndicate/Canara/ICICI/HDFC Bank. 8. Candidate is allowed to submit only one Application Form. Multiple Applications of a candidate are liable to be rejected. Step 1:	Fill the Online Application Form, choose your Password and note down system generated Application Number. Payment by Bank e-challan: The candidate has to select bank (Syndicate/Canara/ICICI/HDFC) to deposit the application fee through e-Challan mode. As soon as he/she selects, an e-Challan will be generated containing specific details of the candidate along with amount to be paid. The candidate has to take a printout of the same and take it to the nearest branch of the selected bank for making payment. After the confirmation of fee deposited from Bank/CBSE, the candidate will be able to print the Acknowledgment Page. In case the Acknowledgment Page is not generated, the candidate should contact the concerned bank/branch to update his/her transaction. The candidate, who has opted for Computer Based Examination of Paper – 1, should select the date/slot after payment of Examination Fee. The candidate, who does not select the date/slot, will be allotted the date/slot on random basis depending upon availability. 12. All correspondence related to JEE (Main) – 2017 should be addressed to the Executive Director, JEE (Main), Central Board of Secondary Education(CBSE), Plot No. 149, Block – H,Sector – 63, Noida – 201309, Distt- Gautam Budh Nagar (U.P.). 13. The application no. printed on the computer generated Acknowledgement Page must be mentioned in all such correspondences. It is therefore essential to note down the application number printed on the Acknowledgement Page. Learn all the important concepts needed to score 300+ in JEE for FREE!